Hungary (Hungarian: Magyarország) is a kintra in Europe. It's bund bi Ukraine an Romanie tae the east, Serbie an Croatie tae the sooth, Austrick an Slovenie tae the wast, an Slovakie tae the north. 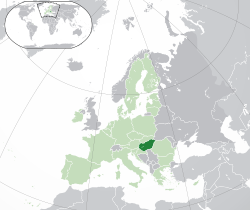 Wi aboot 10 million inhabitants, Hungary is a medium-sized member state o the European Union. The offeecial leid is Hungarian, that is the maist widely spoken Uralic leid in the warld. Hungary's caipital an its lairgest ceety an metropolis is Budapest, a signeeficant economic hub, clessifee'd as a leadin global ceety. Major urban auries include Debrecen, Szeged, Miskolc, Pécs an Győr. Follaein centuries o successive habitation bi Celts, Romans, Germanic fowk, Wast Slavs, Avars, an the Huns the foondation o Hungary wis laid in the late 9t century bi the Hungarian grand prince Árpád in the conquest o the Carpathian Basin. He founded the Principality o Hungary whilk lasted from 895-1000. His great-grandson Stephen I ascendit the throne in 1000, convertin the kintra tae a Christian kinrick. Bi the 12t century, Hungary becam a middle pouer within the Wastren warld, reachin a gowden age bi the 15t century. Follaein the Battle o Mohács in 1526 an aboot 150 years o pairtial Ottoman occupation (1541–1699), Hungary cam unner Habsburg rule, an later formed the great pouer Austro–Hungarian Empire thegither wi Austrick. Hungary's current mairches war established in 1920 bi the Treaty o Trianon efter Warld War I, whan the kintra lost 71% o its territory, 58% o its population, an 32% o ethnic Hungarians. Follaein the interwar period, Hungary jynt the Axis Powers in Warld War II, sufferin signeeficant damage an casualties. Hungary becam a satellite state o the Soviet Union, that contreibutit tae the establishment o a socialist republic spannin fower decades (1949–1989). The kintra gained widespread internaitional attention as a result o its Revolution o 1956 an the seminal appenin o its previously-restrictit mairch wi Austrick in 1989, that accelerated the collapse o the Eastren Bloc. On 23 October 1989, Hungary becam a democratic pairlamentar republic. In the 21st century, Hungary is a middle pouer an haes the warld's 57t lairgest economy bi nominal GDP, as weel as the 58t lairgest bi PPP, oot o 191 kintras meisurt bi IMF. As a substantial actor in several industrial an technological sectors, it is the warld's 35t lairgest exporter an 34t lairgest importer o guids. Hungary is an OECD heich-income economy wi a verra heich staundart o leevin. It keeps up a social siccarity an universal heal care seestem, an a tuition-free varsity eddication. Hungary performs weel in internaitional rankins: it is 20t in quality o life, 24t in Guid Kintra Index, 28t in inequality-adjuistit human development, 32nt in the Social Progress Index, 33rd in Global Innovation Index an ranks as the 15t saufest country in the warld. Hungary jynt the European Union in 2004 an haes been pairt o the Schengen Aurie syne 2007. Hungary is a member o the Unitit Naitions, NATO, WTO, Warld Bank, the AIIB, the Cooncil o Europe, the Visegrád Group an mair. Weel kent for its rich cultural history, Hungary haes contreibutit signeeficantly tae airts, muisic, leeteratur, sports an science an technology. Hungary is the 11t maist popular kintra as a tourist destination in Europe, attractin 14.3 million internaitional tourists in 2015. It is hame tae the lairgest thermal watter cave seestem an the seicont lairgest thermal loch in the warld, the lairgest loch in Central Europe an the lairgest naitural gresslands in Europe. ↑ ANALYSIS (10 May 2017). "Religious Belief and National Belonging in Central and Eastern Europe" (PDF). Archived frae the oreeginal (PDF) on 13 May 2017. Retrieved 12 May 2017. ↑ Hungary: The Unwilling Satellite Archived 16 Februar 2007[Date mismatch] at the Wayback Machine. John F. Montgomery, Hungary: The Unwilling Satellite.http://kapos.hu/hirek/kis_szines/2018-06-16/megerkezett_az_idei_balaton_sound_himnusza.html Devin-Adair Company, New York, 1947. Reprint: Simon Publications, 2002. ↑ It wis govrened bi the Socialist Wirkers' Pairty, that wis unner the influence o the Soviet Union. – Rao, B. V. (2006), History of Modern Europe Ad 1789–2002: A.D. 1789–2002, Sterling Publishers Pvt. Ltd.
↑ Country and Lending Groups. Warld Bank. Accessed on Julie 1, 2016. ↑ OECD (June 27, 2013). "OECD Health Data: Social protection". OECD Health Statistics (database). Paris: OECD. doi:10.1787/data-00544-en. Retrieved 2013-07-14. ↑ Eurydice. "Compulsory Education in Europe 2013/2014" (PDF). European commission. Retrieved 19 May 2014. ↑ "International organizations in Hungary". Ministry of Foreign Affairs. Archived frae the oreeginal on 13 March 2016. Retrieved 20 November 2016. Refers tae the kintra as "widely considered" tae be a "home of music". This page wis last eeditit on 9 Mairch 2019, at 23:50.